Interestingly, the salad didn't really taste like cucumber. Recipe is below. Salmon for four (or two very hungry) people. Well I was more than a little surprised to find salmon on sale. And a pretty good sale too at $4 off the regular price per pound. It still made it shudder-inducingly expensive but you have to eat fresh fish every once in a while. 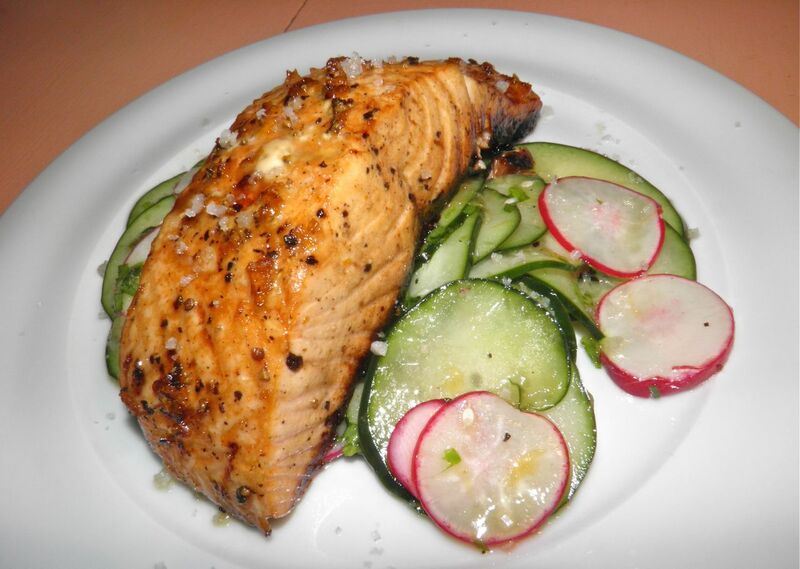 Salmon is very good for you and should be included in your diet regardless of what you hear. Studies have shown the benefits far outweigh the risks of consuming fish. Some important benefits of eating salmon are: cardiovascular health, cancer defence, depression fighting properties, heart health, brain function health, muscular degeneration prevention, and deep vein thrombosis protection to name just a few. These are all due to the high Omega-3 fatty acids and other healthful elements found in salmon, wild or farmed. So there you have it. Now the trick is to cook it so that it’s more than passably tasty. Maple and orange are a marriage made in heaven. Salmon is also always best roasted when prepared inside. Outside it’s a different story. Planked salmon is the way to go. up the cut sides. This is about 3/4 the way there. But enough about the future. I’m hungry tonight. Salmon should be cooked as one governs a great nation – don’t overdo it (according to Lao Tzu…). I tend to agree. Overcooked salmon is dry. Follow my directions and you’re (almost) guaranteed to have a delicious meal that will have people asking for the recipe – or better yet, seconds! 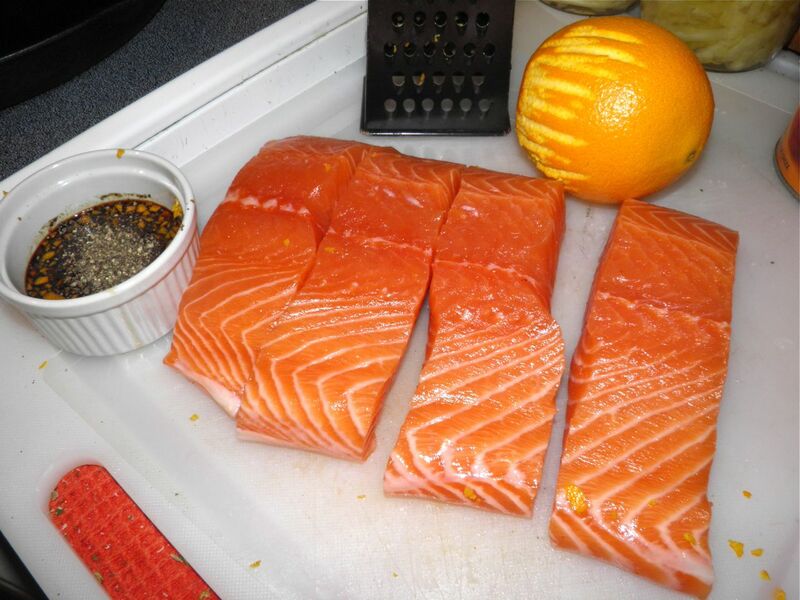 If using a single filet, cut the salmon into four equal serving portions. Try to ensure all your pieces are of relatively equal thickness. Heat the oil in an oven-proof pan. In a small bowl mix together the remaining ingredients. Brush the filets liberally with the mixture, making sure to use all of the glaze. 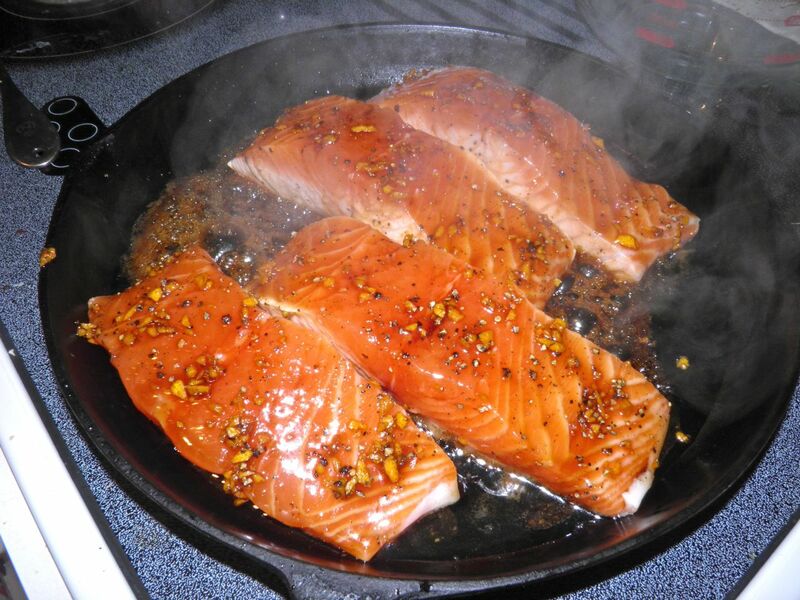 Place the salmon skin side down in the hot pan. 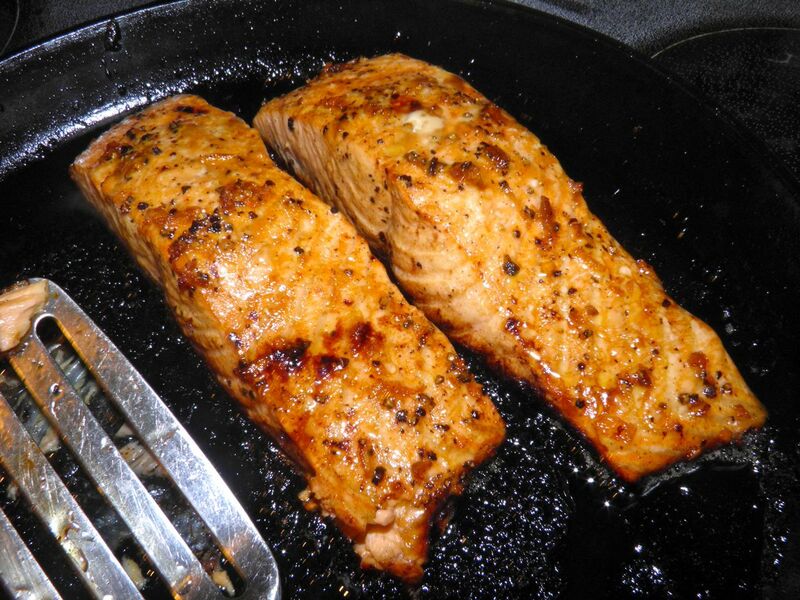 Let the salmon cook in the pan until it turns opaque up the sides of the fish. The tops will still be raw but the bottoms will have released from the pan. Place the pan in the hot oven and roast the salmon until it is cooked through. This will take between 10-15 minutes depending on the thickness of your filets. The flesh will flake easily and be opaque. Do not over cook or the salmon will dry out. Slice the cucumber and radishes with a mandolin into very thin pieces. Toss with the chopped tarragon. Mix together the orange juice, oil, salt and pepper and whisk well. Pour over the vegetables and toss again.